Freedom Day (Belarusian: Дзень Волі) is an unofficial holiday in Belarus, which is celebrated on March 25 to commemorate the creation of the Belarusian Democratic Republic on that date in 1918. The day has been celebrated as the Independence Day of Belarus by the Belarusian independence movement since the early 1920s. The day has been widely celebrated by the Belarusian diaspora. In the United States, governors and US presidents have traditionally issued official greetings to the Belarusian American community on the occasion of March 25. In today's Belarus, people and groups largely opposed to the current Belarusian government under president Alexander Lukashenko celebrate the holiday. The government does not recognize it for the stated reason that the Belarusian Democratic Republic was created by the Germans, who were occupying Belarus in 1918. Celebrations of the holiday are an annual occasion for anti-government protests. 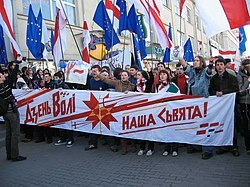 Wikimedia Commons has media related to Freedom Day (Belarus). This article related to politics in Belarus is a stub. You can help Wikipedia by expanding it. This page was last edited on 25 March 2018, at 18:10 (UTC).